Busy busy busy, it’s been a less of a flap and more of a getting things done with calm and serenity today or as near as I can ever get to being calm and serene. I am excited about my new acquisition. I collected it last week, it’s this beautiful log basket. 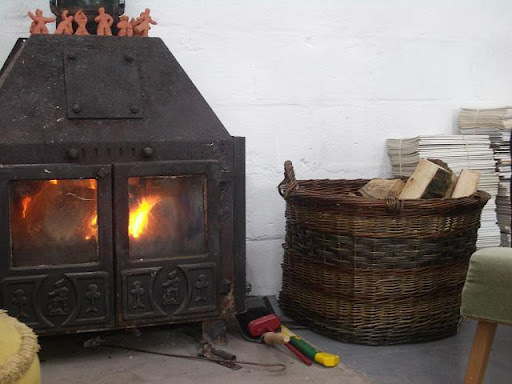 I was rather embarrassed to be keeping my fire wood in a plastic box by the side of the fire, and well really any excuse to have another of this man’s baskets. I love a beautiful basket and this certainly is that. 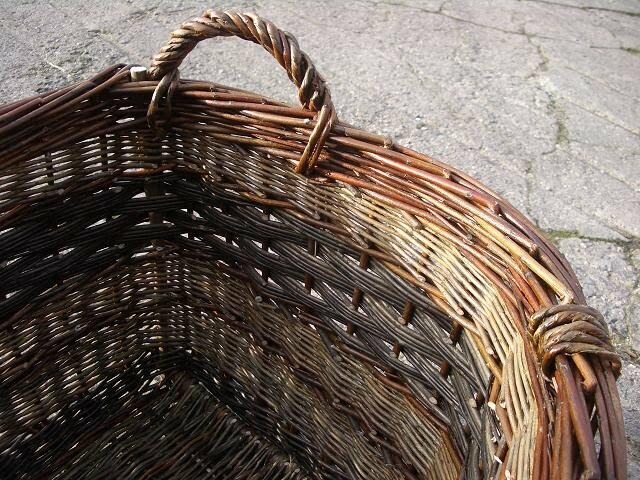 It’s made by Trevor Leat who is based in Auchencairn, just on the coast here. Do please have a look at his website to have a look at the wonderful things he gets up to. As I say I love baskets, after pots I could happily collect baskets but they do take up rather more room, although a basket full of pots, hmmm, nice thought. Trevor is trying to find a supplier of willow in the states. He’s hoping to visit the USA this year but needs to be able to source a good amount of willow over there and he’s having a bit of trouble. So over to you my American readers, where can he get it from? Do any of you have basket weaving friends? Can you help him out? It would be great if you can, let me know and I’ll pass it on or else email him directly. Thank you in advance for any help. 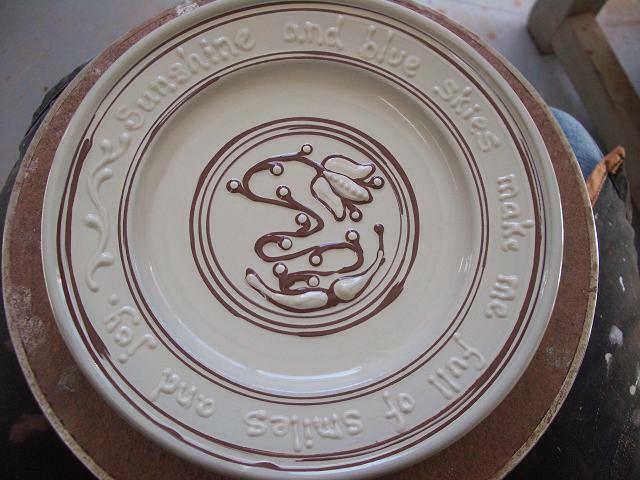 I have made 15 or so little plates, I wanted something that I could make quite a few of and not need to feel too precious about so that I could get into a bit of a slip trailing rhythm and hopefully in doing so and in not trailing things that had to be the same that I might get into a slightly looser mode. I did all the plates this morning in a couple of hours and had a ball. I must do that again. A year or so ago I set myself the task to slip a couple of dozen pie dishes in less than three minutes each for the same reason. It was great. I needed another dozen or so as I could have just carried on and on. Hopefully they’ll be ready to ship off to these workshops in America. Fingers crossed. The lovely ladies at MadeByHandOnline have just made me maker of the week and have written a blog post about me. You can see it here. The have a selection of my Birdie pots for sale on line in their shop, including my brand spanking new Birdie cake stands. Tomorrow I have thirty odd mugs to slip and plenty pots to be throwing once I’ve glazed the kiln load of bisque pots that are ready and waiting to be finished. Hopefully I’ll be progressing in much the same jolly manner tomorrow too. 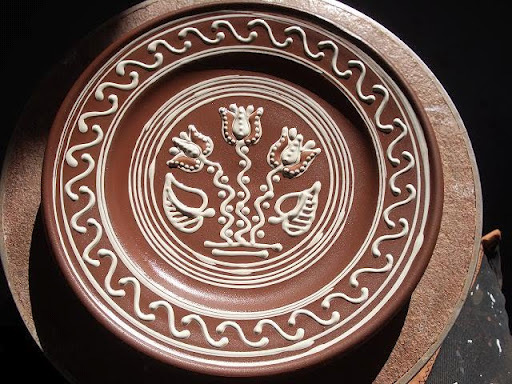 This entry was posted in log basket, plates, pressed dish, Trevor Leat. Bookmark the permalink. I love your designs, Hannah, did you know that often they look very Minoan? My mother, who was an archaeologist, had a wonderful book of Mycenaean and Minoan designs and years ago, when I used to do slip-trailing, she often asked me to do designs from it. I'll see if I can find some of them for you before Kindrogan – not long now! 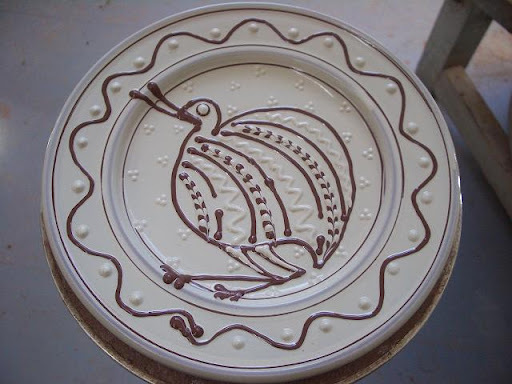 lovely plates-it is fun doing a row of plates.Just a thought..why source willow in the US? Are there not closer sources, or is it a specific breed needed? Hi GZ, he needs the willow in America for when he goes there to do some work. He grows his own here.Hi Veronica, you have mentioned that before. It's not something I've specifically looked at but so many things interweave don't they. Looking forward to seeing you again. 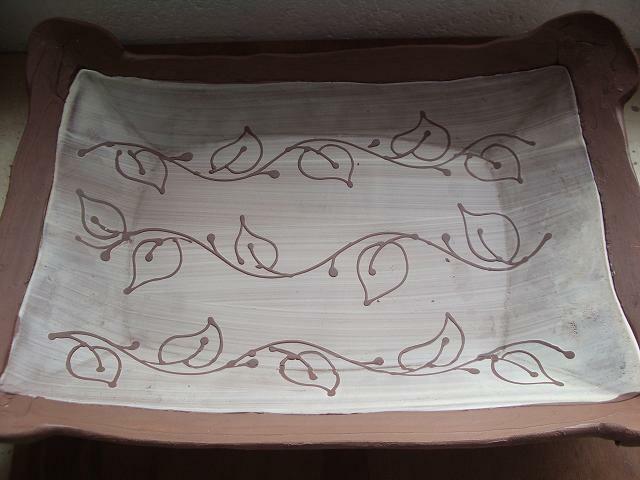 Beautiful basket~ I did check out Trevor Leat's site, what amazing work! 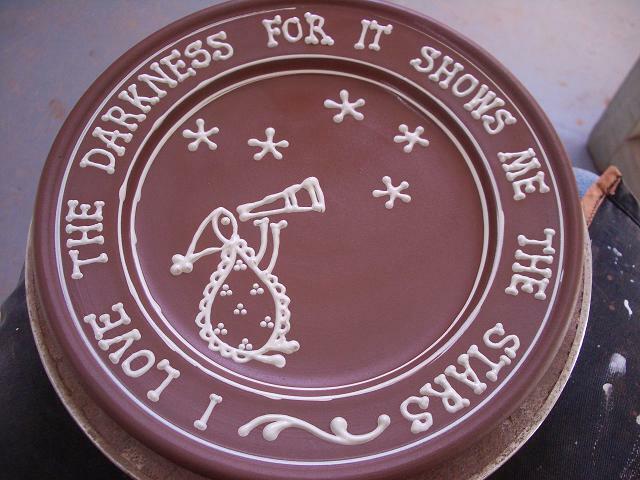 The plates are fabulous! I love the sayings and the designs. How do you get your wording to space out so well? Hey Dave, long time no see.1 No there aren't there are 12, they were part of the 12 before 12 challenge from Michael Kline last year, if there are more then there is some serious magic going on and maybe it could spread to other pots, that would be great!2 Are you coming up to SF again? Trevor will gladly do commissions, this was. They're dam fine baskets aren't they.As for the spacing of the lettering, I'll have to think about that. It's just visual really, I don't tend to work it out other than "will that amount of words fit? Hmm yes i think so…"